Nearly two decades have come and gone since the first adjustable dumbbell hit the market. 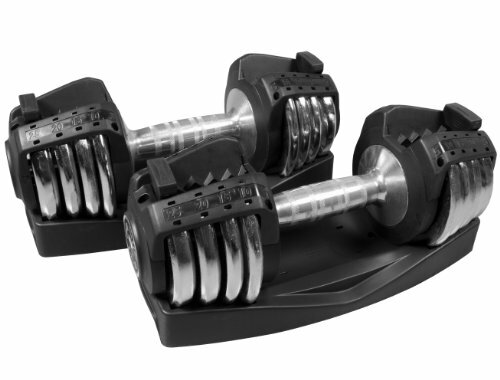 Built with the home gym enthusiast in mind, these innovative weights were a revolution for consumers seeking the functionality of a full set of dumbbells while fighting the space constraints of an office or garage. It didn’t take long for weight lifters to see the benefits of saving space and money by investing in these versatile dumbbells. Though the idea is generally the same, the market for adjustable dumbbells has gotten increasingly competitive between a variety of brands and designs making the decision harder and harder for you, the consumer. Fret not, we are here to help. We’ve compiled a list of the 10 best adjustable dumbbells on the market to help you in your decision making. 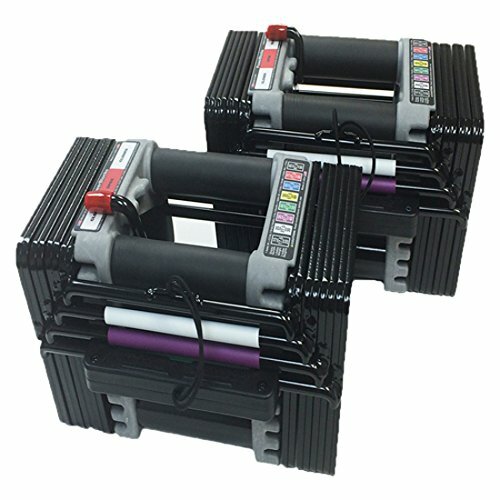 At first glance the PowerBlock system can be intimidating. 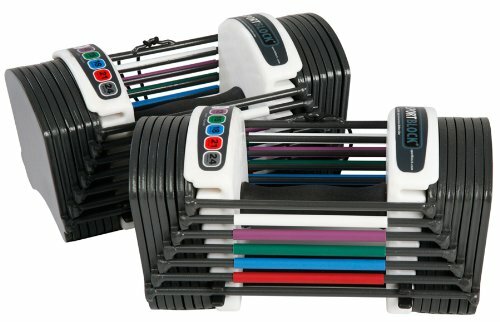 They look more like first generation Macintosh computers than dumbbells and we all know that simplicity is key when it comes to lifting weights and not having to spend too much time figuring out how to solve a Rubik’s cube. If you can get past the unorthodox shape and design you’ll see (and feel) that this is a high quality, well-built product. Pros – highly functional, well built, 5-50 lb adjustment. Cons – odd shape/design, weight change system takes some getting used to. One of the more aesthetically pleasing designs in the adjustable dumbbell world, the Xmark makes a great addition to any home gym arsenal. 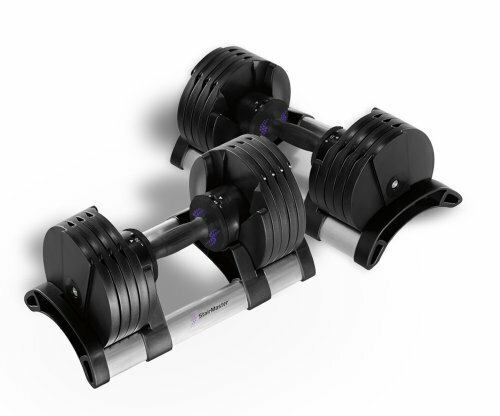 It is simple to use add or remove weight and feature a built in stand that keeps the more traditional looking dumbbells from rolling around on a flat surface. The design does have some plastic aspects such as the grip and the weight cradle but both are high grade and plenty strong to stand the test of time. The Bowflex name is quite possibly the most recognizable brand in the fitness and weight lifting industry. 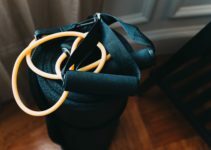 Their products captivated the masses by use of infomercials and advertising and have done well to back their marketing dollars with solidly built, versatile workout equipment. The SelectTech 552 has a traditional dumbbell shape and features a weight changing system that has made the process easier than ever. 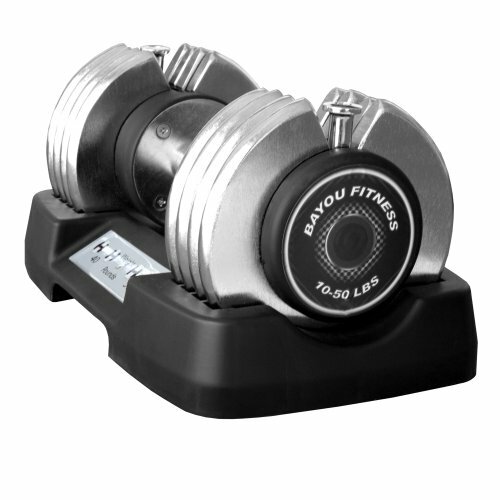 The weight is changed with a dial on the end of each dumbbell while they are in their respective cradles. This dumbbell set is ideal for the intermediate lifter who likely can get full use out of the entire range of weight ranges. No matter if you are doing three way raise with 10 lbs on each dumbbell or chest press with max weight, these dumbbells are fit for the challenge. Cons – The plastic coating on the weights themselves take a little of the luster from an otherwise eye pleasing design. All the big players got their hand in the cookie jar on this innovation in the weight lifting market and Weider is no different. The design is one of the simplest of the bunch and features nothing special or unique really. The weights are large circular shaped disks of equal size. The weight adjustment is latched and color coded and must be adjusted while weights are in their cradle. The functionality and ease of use are on par with the competition. 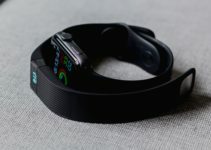 They could have done better on the design and look of the product but for those just looking for a solid, functional product, this is an industry trusted brand and reputation. Cons – Limited upper weight limit. Best for light weight training. This set is perfect for the heavy lifters who use their dumbbells for a wide variety of exercises. This set is adjustable from 5 to 75 lbs! The weight adjustment system isn’t quite as streamlined as some of the other competitors but it is easy enough and comes with a storage tower that takes up less than two square feet. The design is more of a traditional screw on style where a locker at the end of the bar secures the weights into place so they can safely be lifted. As mentioned, the weight changing is a little more in depth than some of the other options but the storage stand and simple design make up for that. Never before have you had the option of 5-75 lb. dumbbells in a two square foot area. Pros – Options from 5 to 75 ensure you have a weight for every exercise. Cons – weight changing system is more traditional and does not make for quick, seamless weight transitions. Perfect for beginners or low-intensity lifters. 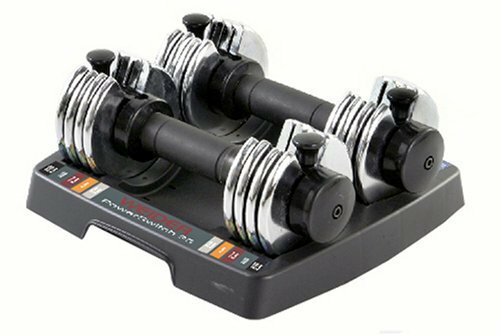 These dumbbells are well suited for novice lifters or any person looking to lift weight at a lower intensity. The system has a unique designed and at first glance, you wouldn’t guess it is a dumbbell. Although its look are unorthodox the mechanics work flawlessly on flat, hard surfaces. 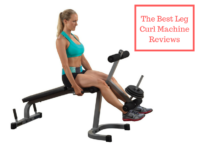 However, one knock on this product is that weight selection gets finicky if the dumbbells are on carpet as the balance of the system can shift and throw of the alignment of the selector. 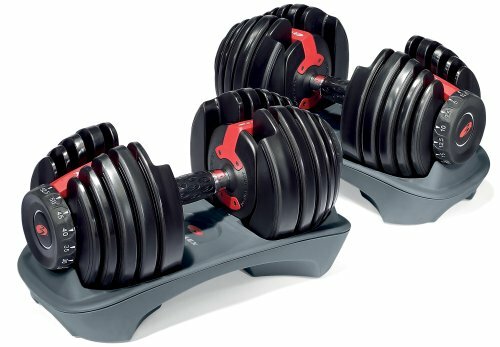 This set is affordable, functional and likely the most space-efficient set of dumbbells on the market. Pros – Small, easy to adjust weight on solid surfaces. Cons – Weight adjustment is finicky on carpet, weight only goes to 24 lbs, feels a little cheap to the touch. The 25 lb. class has a lot of solid competition. There are similar designs, similar weight switching methods and similar looks for a few of the best on the market. For the price and functionality of a 25lb adjustable dumbbell, Bayou Fitness has achieved the gold standard. 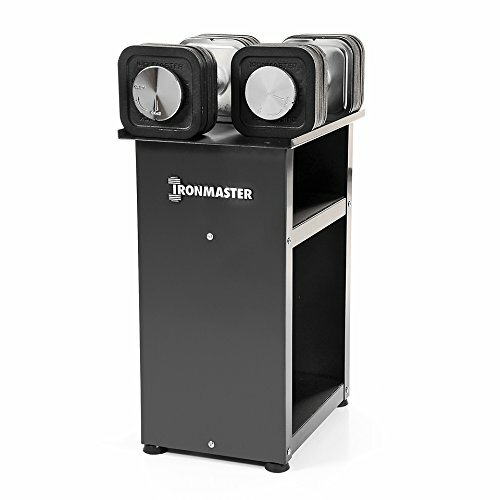 Durable construction, aesthetically pleasing and easy weight selecting combine to make a formidable and versatile 25lb dumbbell. If you are purchasing this set you know the weight restrictions and have accepted that you may outgrow them quickly. However, if 25 lbs is all the weight you need, look no further. 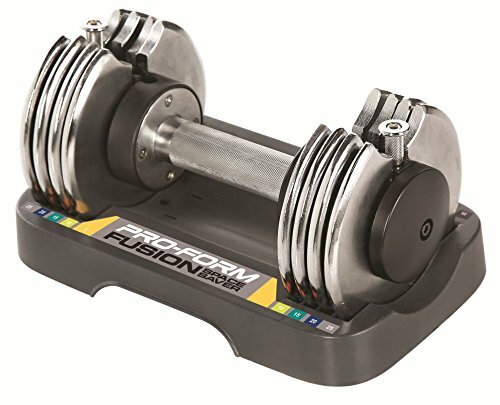 The ProForm uses one of the more popular designs of the adjustable dumbbell. The weight selection is proven to be one of the easier methods and can be done swiftly. The look of the dumbbell is on the traditional end of the spectrum and features chrome plated weights that are pleasing to the eye. The cradle is made of plastic and while it may look cheap, it does its job flawlessly. When at max weight the weights have tendency to rattle together, a sound that is consistent in this product and does not warrant consumer worry. 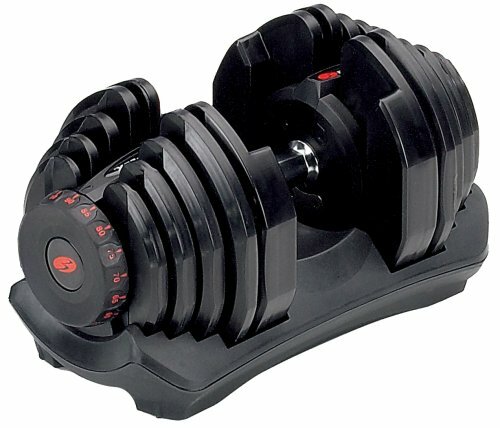 The Bowflex SelectTech 1090 is the most versatile and functional of all the other adjustable dumbbells on the list. These monsters are fully adjustable from 5-90 lbs. and any committed home gym enthusiast would be smart to have these on their wish list. For beginners this set would be overkill, not many people are strong enough to do workouts involving 90lb dumbbells. This set is for the advanced lifter who is fighting space constraints. Weight is adjusted easily in 10lb increments and the product is backed by an industry leading name, Bowflex. These dumbbells make great alternatives to dumbbell sets that traditionally would take up 40 – 50 square feet. Valuable footage if you’re trying to turn an office or garage into a dual purpose space. Pros – Highly adjustable, durable construction, quiet while lifting. Cons – high price point, take up more space than sets with lower weight capacities. The Twistlock weight adjustment is a game changer here. This new feature allows the lifter to switch weigh without ever taking his or her hand off the grip. Simply twist clockwise or counter clockwise for more or less weight and then pick it back up and continue your workout. These dumbbells are built for the advanced lifter in mind as your average Joe will not be able to take full advantage of the 100 lb. weight range. This set would be a great alternative for those looking to downsize on space needed for their home gym while not sacrificing any workout light or heavy. Compared to the Bowflex the Stairmaster wins out in both functionality and price. Pros – changing weight is a breeze, easy to use, innovative design. Cons – must be sure that weight is locked into place, sometimes it doesn’t secure properly.